Feminist publication GRLSQUASH approached with an odd request: create a portrait of a strong woman out of produce for their sophomore cover. A squash girl. Itching to for something new and holding an Alphonse Mucha-esque concept in my back pocket, I decided this was the right vehicle to try an ambitious illustration. It was very important that I depict a confident woman of color, opting to utilize an afro and layout synonymous with seventies gig posters. While I hand drew and digitally colored the sketch, I hand cut the features from scratch out of basil leaves and zucchini skin without guides. 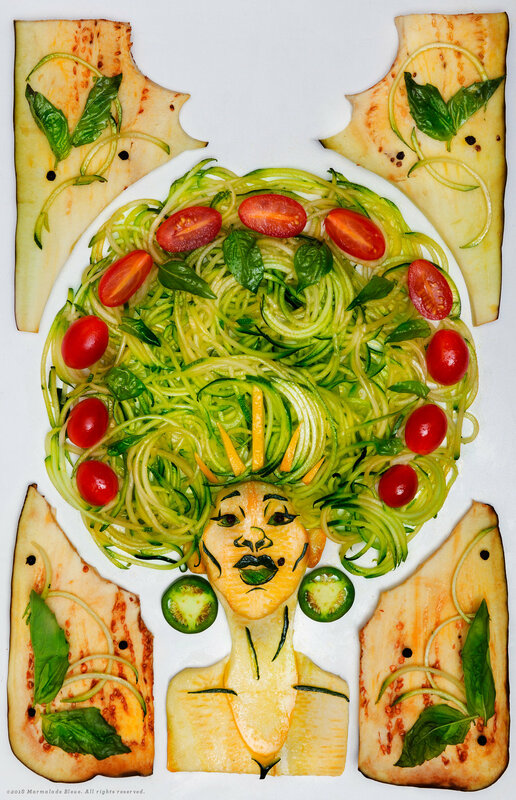 A zoodler produced the consistent zucchini hair, garnished with cherry tomatoes and small basil leaves. Eggplant framed the figure with art nouveau shapes, allowing space for the masthead and headlines. The final image is a snack, albeit a healthy one.